From left are Joyce Nickell, Ken Stribien, David Wayne, his manager Jeanette O’Bryant, and Dan Slocum. 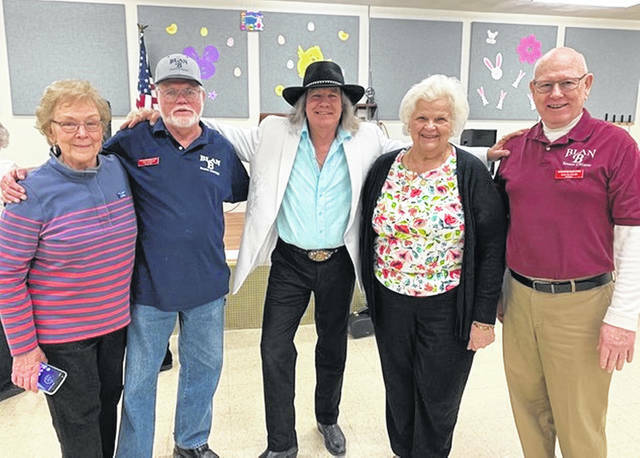 BLANCHESTER — Blanchester Senior Citizens were entertained after their March 20 social meeting and meal by singer David Wayne. He performed a medley of country, spiritual, and pop music. The 75 people in attendance enjoyed and often sang along with him. Entertainment is planned after each social meeting which occurs on the third Wednesday of each month. At the next social meeting on April 17, Jack Blosser, site manager of Fort Ancient, will present an informative and entertaining program. All folks over 50 are invited to come as a guest to hear the program on April 17. The center is located at 707 N. Broadway, Blanchester. and the meetings start at noon.